Every ten years since the 1930's, AAACE publishes a handbook that addresses the current issues, research and practices in the field of adult and continuing education. The 2010 Handbook is available from Sage Publishing. Click here to order a copy. 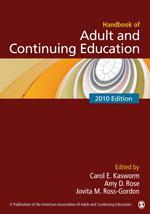 To review the table of contents of the past Adult & Continuing Education Handbooks click here.